I've had that sort of week. I haven't had time to think. 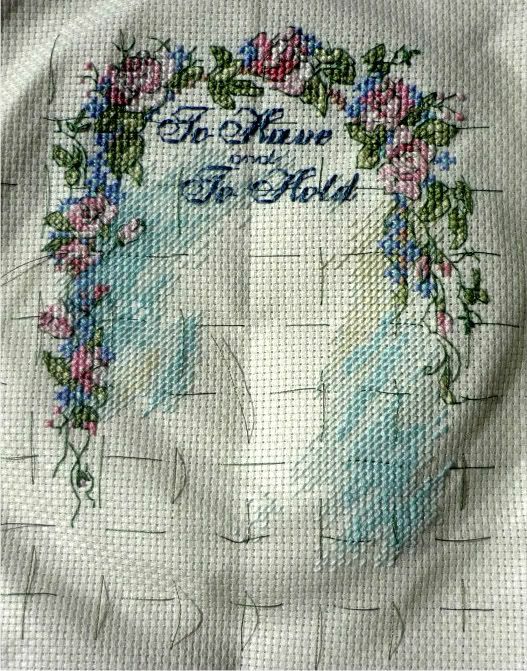 I've done barely any stitching but I seem to have not stopped. I now teach 4 afternoons during the week and 5 mornings. I also nanny one morning and one afternoon during the week. Yes that means I am essentially working 5 days full time and one half day. As much as I love softball I can't wait until it's over so I get some of my weekend back! I have been reading a lot because I haven't been able to settle in to any one thing, and I can read in 5 minute breaks. I have been reading Mercedes Lackey's "Sleeping Beauty". It's from her 500 kingdoms series, fairy tales with a twist. I love her writing it's so enjoyable to read. I have quite a large number of her books in my collection. I have most of her Valdemar series and I am collecting the 500 kingdoms books now. I do have some pictures to post. I have put some words on the To Have and To Hold and I have been making labels to put on the back of my pictures. The labels say "Handmade with love Caitlin 2011" I have stuck them to the back of the frames because you can't put signatures on the front or they don't like them when you put the exhibits into shows. I put the frogs and all our yesterdays into the Mt Gravatt Show yesterday and tomorrow I get to see them :D. I know this is just a local show for my area and nothing compared to the royal queensland show (EKKA) but the Mt Gravatt Show means a lot to me. For as long as I can remember I have gone to the show. Every year we looked forward to seeing what fun stuff will be there to see. I live just behind the showgrounds and we can see the fireworks from our back porch. We walk out our back gate and up to the show, the memories are many. So being able to see my own work in this show will be amazing. I will post pictures tomorrow of some of he displays, they are always gorgeous and I saw them setting up the quilts when I dropped in my cross stitch so it is exciting. I will try and get on more frequently this week but we shall see it should hopefully be not that bad.